UPDATE 6/8/15: At WWDC yesterday, Apple revealed an update to its native Notes app for OS X and iOS that addresses just about all of my needs below. I installed the very first developer betas and switched over to Notes immediately, and I’m almost completely satisfied. Notes.app now supports media attachments, and though it doesn’t have quick capture built in, it does have a system-level sharing extension so my quick-capture apps can all send straight to Notes. The only thing I wish were different is the choice to go with folders rather than tags. Since a note can only live in one folder, one is forced to pick a topic, rather than apply multiple tags for notes that live in the gray area. In any case, this post is now obsolete, but it is preserved for posterity. What is a note? For all the effort going into so-called notes apps, I don’t think the software industry has a coherent answer to that question. I know because I’ve tried every notes app I’ve ever come across, and most of them answer it differently. My problem is that I, a mere layperson, have a better answer than any app offers, and now I have to write a tech nerd blog post about it. I’m not talking about note-taking apps. “Taking notes,” whether it’s in a class or a meeting, takes place all on one sheet. The “notes” for a session are all its important points at once collected and organized in a single document. That’s its own category with its own design nightmares. I’m talking about the short, quick, discrete, personal scraps of information we know as notes because that’s what Apple’s built-in Notes app tells us, and Apple knows how everything should work. Just kidding. In human terms, a note is a captured moment of inspiration on which one hopes to act later. The thought that triggers the capture of a note is, “I need to remember this right now!” Once captured, a note goes into a pile. Later, when it’s time to act on the idea, one retrieves the relevant note from the pile and turns it into a more permanent, full-fledged Thing of some kind, rendering the note itself obsolete. Ideally, unless one is a hoarder, one disposes of the note after its idea is realized. In software terms, a note is a single persistent file with some basic contents and simple metadata. Once captured, a note must be retrievable by the relevant metadata, even if it’s just order of creation. A note must be easily and clearly summarized, so that it can be displayed in the list of existing or “active” notes. A note must be theoretically permanent, in case the user is a big-time procrastinator, but keeping notes forever is not the ideal use case. Deleting or archiving notes should be treated as a common, encouraged user action. At this point, the dozens or millions of notes app developers reading this post are like, “That’s all you got, wise guy? I thought you were gonna teach us something about notes, not describe our own app to us.” But bear with me. In the broadest sense, the content of a note is whatever you need to remind you of its meaning later. Text is obviously a convenient medium for this, but mobile and wearable devices make other media just as convenient: audio, images, and video are all ideal for various kinds of notes and note-takers. The subject of the note, the environment in which the note is being captured, the form factor of the device, and the user’s personal proclivities are all variables that make any one of these media more or less useful at any given time. So, more specifically, a note contains text, and/or audio, and/or image(s), and/or video(s). A good note contains exactly as little and exactly as much of that stuff as necessary to convey the idea. Video seems slightly less important to me for some reason, but it would still be nice to have. Finally, notes need some metadata to be retrievable and useful. At a minimum, notes need time and date stamps, so notes can be browsed by the order in which they were created. Other kinds of metadata aren’t strictly necessary, but a pile of notes becomes much more useful if it can be filtered by tags. Location at which the note was created is another handy metadatum that can allow the user to filter notes by spatial context without having to manually tag. Beyond these metadata, I really don’t think any further organization is necessary for notes apps. Notes is a mobile app with clients for big screens. There’s no reason to worry too much about the notes interface on desktop; just make it work like the phone while taking advantage of the full keyboard for quick entry. The phone is where most of the capture is going to happen. Even at a desk or in an office, picking up the phone to snap a photo will be a frequent interaction. In a notes app, the bulk of the user interface effort should be concentrated on quick capture. All the surprises and variety will happen during the capture process. The user will stuff all kinds of things into notes. A full-featured notes app would make it lightning-fast to capture a new note in any medium: text, image, audio, or video. Think about a full-screen launcher divided into quarters with big, fat icons in each one. (This interface is best exemplified by Tumblr for iPhone, which is always my chosen example of an iPhone app that’s doing it right.) After capture, this ideal notes app would treat all notes the same, regardless of input method, because notes are notes. Besides capture, the other main screen of a notes app is the menu of notes. The simplest thing to do with this menu is show all notes in reverse chronological order. A good place to put the menu for filtering the list is right in the title bar at the top. Alternatively, the title bar menu can be used for ordering the list (oldest first, newest first, alphabetical, etc. ), and a side tray can be used for filtering by tag or location. This tray is also a good place to put the archive and settings menus. A handier, slightly more complex way to implement the menu is to have an “inbox” view, where notes that have not yet been tagged pile up. Later, when the user has time, she can go through the inbox and tag them to assign them to their appropriate group, clearing them out of the inbox. The legendary task manager OmniFocus works this way, as does the writing app Ulysses, but I’m yet to find a notes app that works this way out of the box. In apps that support sending notes to default lists, like Evernote, it’s possible to manually create an “Inbox” list that more or less works this way. Finally, in an age of multiple devices backed by cloud services, notes apps should sync. One’s notes should be available wherever one is, regardless of where the notes were created. That means local clients for every device — mobile, tablet, desktop, and wearable — and even the web, in case the user needs to access her notes from someone else’s device. In a pinch, a web client can suffice in the place of a desktop app, but a good notes app should really be available and useful offline. I tried that once. It didn’t go very well at all. There was a time when I was really fired up about Evernote. I took the app at its word and crammed everything I had into it, from audio files to contacts to PDFs to clipped web pages to photo albums. My text notes often expanded to be hundreds of words long. I was basically using Evernote as a word processor and a file system, kind of like Google Drive, rather than a notes app, a starting point. The app encouraged me to do so, and I paid a substantial annual fee to unlock its full power. But Evernote’s insistence on treating “everything you’ll do” as a note forced all kinds of compromises. The interface was so crowded that I couldn’t find a comfortable way to organize it. First it failed slowly, forcing me to backpedal on specific use cases. Then it failed all at once when the company resorted to frequent, utterly unrecognizable, ground-up redesigns at a frantic pace, presumably in order to whip its business into shape. Unsurprisingly to everyone outside of the company, when the app for “everything you’ll do” gets completely redesigned, the user no longer knows how to do anything, and everything he’s ever done is locked inside. So that was untenable. It was made worse by Evernote’s dubious money-making schemes, which were constantly forced into view, competing with the actual work I was trying to do, even though I was already a paying customer. One day, I’d had enough, and I cancelled my premium account and migrated everything out of Evernote, mostly into the good old files and folders built into my computers’ operating systems and sync services like Dropbox. The text contents of my “Inbox” notebook went into a basic notes app designed just for text notes, and I’ve been bouncing around between those ever since. My experiences with other notes apps are much less remarkable, but I should at least mention them here. I only tried Microsoft OneNote for five minutes, because it’s just as burdened by features as Evernote (though more stable and reliable), and it looks like software for planning corporate team-building seminars. Simplenote is good if you can deal with text-only notes, but I can’t, and I’ve had scary sync things happen with it a few times. I love Junecloud’s Deliveries app, so I tried their notes app, Notefile, but it’s text-only, too. Honestly, if I’m going to use a text-only notes app, I’d rather just use Notes.app since it’s built in, and Apple is guaranteed to support it. Text editors like Byword and Notesy work okay as plain-text notes apps, and since they can sync with Dropbox, the notes can show up as files on any computer, and any Dropbox-capable text editor can edit them. That’s fun, but tags are lighter and more flexible for organizing than desktop-style nested folders, and, again, they’re text only. I’ve never tried über-nerd plain-text systems like Notational Velocity or nvALT for the same reason. Other than those, the rest I’ve tried are too janky to mention except one. So which notes app do I use??? @ablaze @brentsimmons It’s on my personal list of dream features. Has been since long before 1.0. But I’m not holding my breath. In the meantime, I have to keep audio notes separately as single audio files in a Dropbox folder, which I capture using DropVox. The huge drawback to using Vesper right now is that it’s not available on desktop yet. It’s been in the works for a year or so, announced when the app reached 2.0 and got sync features, but it isn’t here yet. I’d love even just a thin web client for it, just so I can at least have my notes on my desktop, which is where I do just about all of the actual work that results from the ideas I capture in notes, but I’m guessing they’ll skip that in favor of just finishing the Mac app, which, once it ships, will be a much better solution. In the absence of one notes app that does it all (and nothing more), I have to use a few more apps to get all this functionality, and sadly most of it must be totally separate from my actual library of notes in Vesper. Quick capture is the biggest problem. The fastest way to capture a photo is by swiping up from the bottom to launch the built-in Camera app from Control Center, so I do a lot of that, and then I can add the photo to Vesper once the moment has passed. Other media require third-party solutions, but fortunately Apple has finally decided to allow Launcher into the App Store. That app allows you to add one-tap app shortcuts to the Today screen in Notification Center, which, like Control Center, can be accessed straight from the lock screen. It’s not quite as fast as the Camera trick, because you still have to unlock the phone after you tap the app you want, but it’s good enough. Launcher and Control Center at least make it possible for me to cobble together the four kinds of quick capture I want from my ideal notes app. I use Capture for instant-on video, DropVox for audio, as I mentioned, and I use Scratch for instant capture of text. The cool thing about Scratch is that it lets me just get the text down first, and then it makes it easy to send the text to whatever app I want, but, to my dismay, Vesper is not one of the options because it doesn’t support that kind of inter-app communication yet. It doesn’t even have a share extension yet, but I bet they’re working on that. For now, I just use the quick ‘Copy to clipboard’ action in Scratch, go to Vesper, and paste into a new note. So text capture in my notes app is mostly okay, photo capture is mostly okay, but audio and video still have to live in separate places. Much more challenging for me is the need to use six separate apps — Launcher, Scratch, Camera, DropVox, Capture, and Vesper itself — to get the functionality I want out of a notes app alone, and that’s without an inbox, location metadata, or even a desktop app (yet). This Rube Goldberg machine of a solution leads me to the conclusion that the ideal notes app of ideal notes apps is actually an OS-level feature. That’s the way to make capture as instantaneous as possible while making notes and the files in them ubiquitously available to any app for turning into a Thing. Evernote should have been an OS. They should have forked Android a long time ago, and they should have been making Evernote Phones by now. If you ask me, the only way for a notes app to become a 100-year company, which Evernote CEO Phil Libin often loudly aspires to build, is for it to be the very fabric of starting things on any device. Apple, which is incalculably more likely than Evernote to become a 100-year company, might have been thinking along those lines when it acquired Catch, an Evernote competitor, in 2013. There has been no visible result from that yet — Notes.app is still barely a notes app — but Apple doesn’t do things on whims. From the moment Apple bought a discount Evernote, I’ve considered Evernote a zombie. Of course, by 2013, Apple probably realized that notes apps would have to be completely reimagined for the era of the smart watch. The Apple Watch has exciting implications for the kinds of notes apps I want to see. This device is all about quick actions, and speech-to-text capture is one of its primary use cases. Siri is already pretty good about taking text notes, even with third-party apps; I use it this way with OmniFocus all the time. I expect the Watch to take a huge chunk out of the amount of time I spend thumb-typing notes when I’m out and about. A DropVox Watch app seems like a pretty easy move, too. It’s worth noting — sorry, had to — that Notes.app is not on the Apple Watch. Siri is, though, and you can use Siri to make speech-to-text notes in Notes.app on the iPhone and iPad, so maybe that will still work? Maybe not. Doesn’t matter for me, though, since I don’t use Notes.app, and fortunately, third-party apps seem to be able to build Apple Watch integrations for speech-to-text capture on day one. 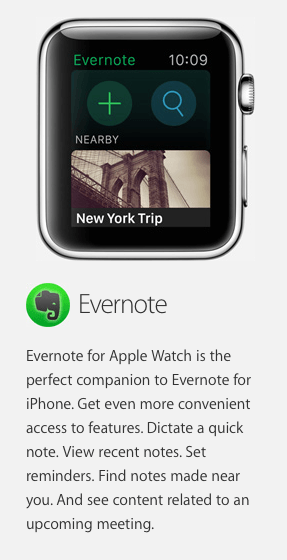 In fact, according to Apple’s website, Evernote itself will be there. I’m betting the Vesper guys won’t be able to resist building a Watch app early on, and that will partially solve the quick-capture problem for text, at least in situations where it’s polite to talk out loud. Who knows what will result from Apple’s acquisition of Catch, especially in conjunction with the company’s bold foray into wearable computing? Though none of this will help Android users very much, the Google Play Store ratings for Google Keep suggest that they’re already quite happy with their OS-level notes app. Of course, Evernote is also quite popular on Android, and Google has a record of killing beloved products that aren’t universally adopted. However, I’m sure Google Keep has some users happily dinking with their notes on their Android Wear devices. If there’s one thing that’s clear about notes apps in 2015, it’s this: No matter how many great third-party developers want to tackle the still-unsolved problem of notes in the era of mobile computing, the future of notes on our desks, in our pockets, and on our wrists — and who knows where else — depends on Apple and Google themselves.